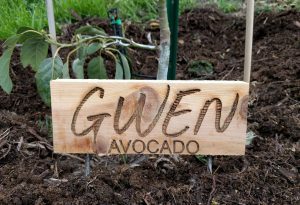 It’s raining as I write this, which brings to life right out my window all of the things I like about using wood chips as mulch around my vegetables. The chips are soaking up the rain so there’s no run off; they’re protecting the soil surface from erosion or crusting — there’s not even any splashing of dirt or compost up onto the leaves of plants; the rain will germinate weed seeds elsewhere but not where there’s a thick layer of wood chips; I can take a walk out there over the wet soil because the chips absorb my footsteps so well. In fact, I think I will. Have a look at the structure of the wood-chip mulch under this cauliflower plant. Notice this: there are chunks of wood, bark, twigs, and leaves of different sizes that don’t fit together well, therefore leaving lots of little caves and crevices. It’s this very quality that allows wood chips to be such a splendid mulch, but unfortunately also engenders its single downside. See that pill bug? That’s the downside. All of those caves and crevices created in a wood-chip mulch provide a perfect habitat for some garden pests, especially pill bugs, sow bugs, earwigs, snails, and slugs. So there’s no free lunch — not even when you get a free load of wood chips delivered. Spread them on your garden paths and under your vegetables and you invite these critters. 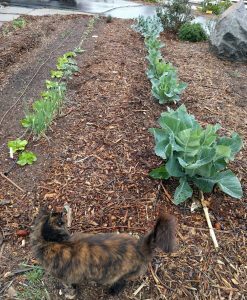 I’ll later mention how I continue to use wood chips as mulch on my vegetables while managing the critters they harbor. But for now, let me note that any other mulch will also harbor these pests to some degree, and even if you don’t mulch, these guys will still find hospitable places nearby, like in between the bricks of a path or at the corner of a wall. 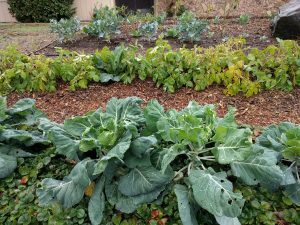 Let’s hear a bit more about the benefits of using wood chips as mulch around vegetables to see if they might outweigh this negative for your garden’s situation too. 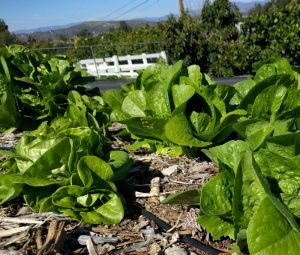 Last winter was a dry one for Southern California, yet my lettuce that was mulched with wood chips never seemed to need irrigation as often as I thought it should. I’d pull back some chips and it was still so moist underneath. It was like the chips had soaked up what little rain did fall and then metered it out to the shallow lettuce roots. Mulches of leaves or compost also conserve moisture, but in my experience wood chips allow vegetables to go even longer between waterings. 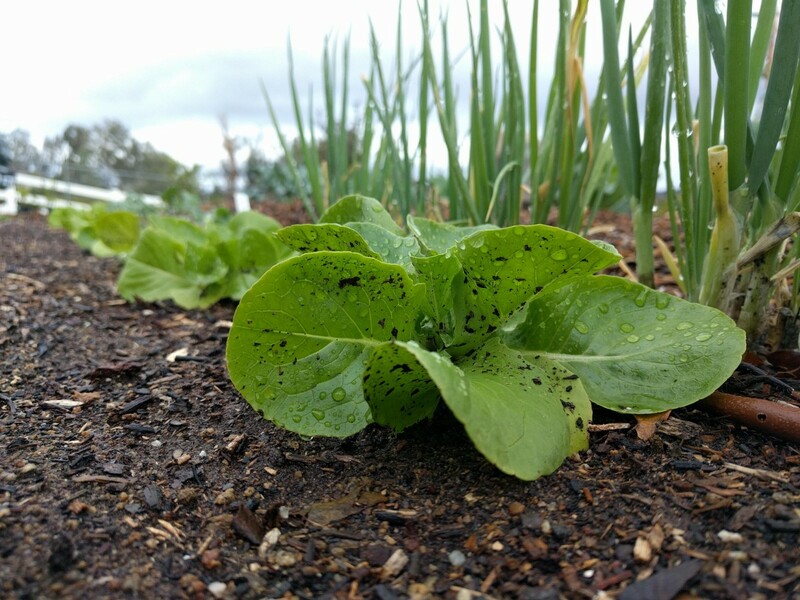 Speaking of lettuce, look at the dirt and compost splashed all over these leaves by the rain today. There are a couple of garden chores I dislike, and having to wash vegetables before eating them is one. 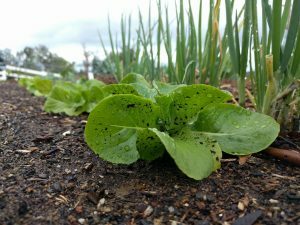 I had spread compost under those lettuce plants when putting them in, but they weren’t quite big enough to spread wood chips under before this last rain started. 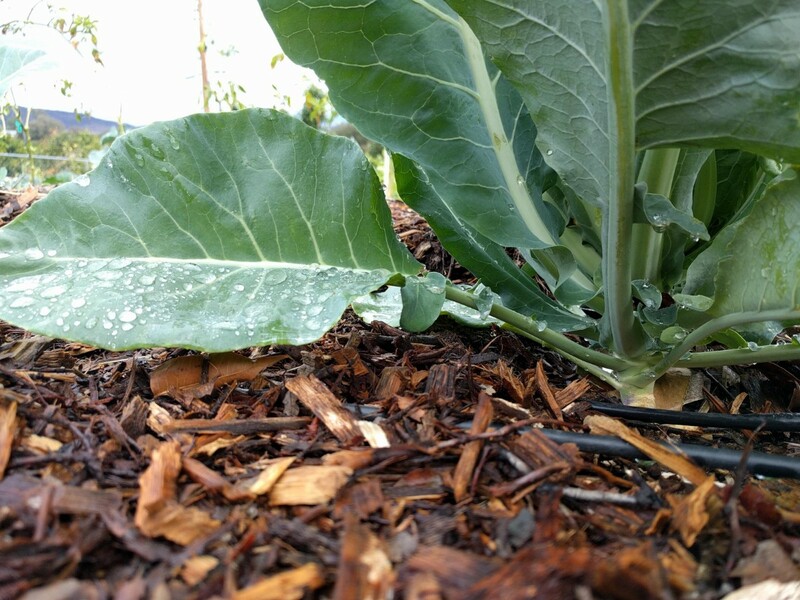 Compost as mulch doesn’t prevent the splashing; wood chips does. 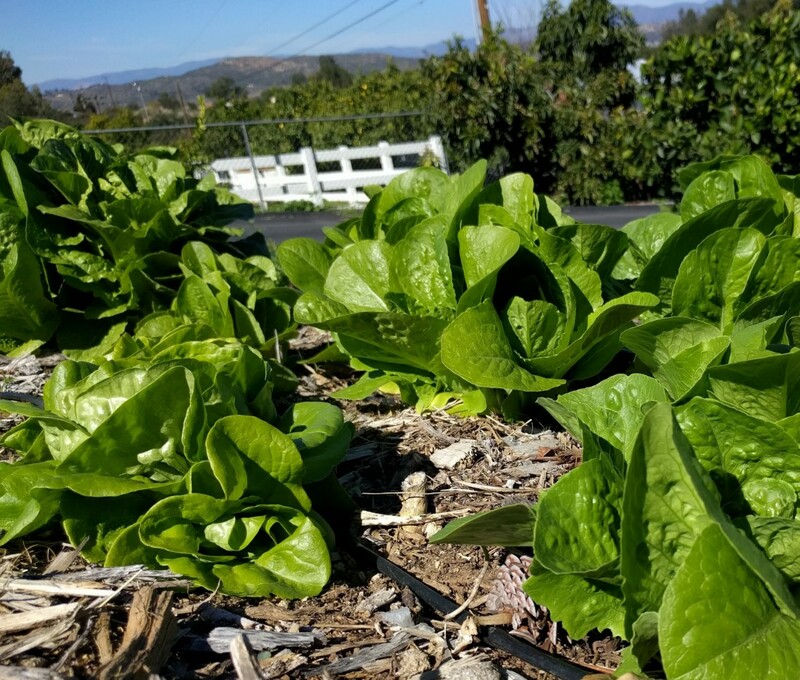 Here are some mature lettuce plants from last year with wood chips under them. They stay so clean that I never need to wash them before eating, although I do usually pick off and discard a couple of outer leaves when harvesting a full head. 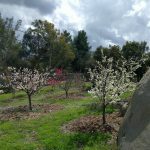 In a similar vein, covering paths between the rows or beds of your garden with wood chips allows you to walk around without getting your shoes mucky, even while it’s raining. The wood chips just don’t stick to anything, no matter how wet. Another great effect of a wood-chip covered path is that you don’t have to deal with weeding there. As long as you keep the mulch thick, almost no weeds will grow in your paths. The exceptions are the few seeds that fly in from a wind and perennial weeds like Bermuda grass. 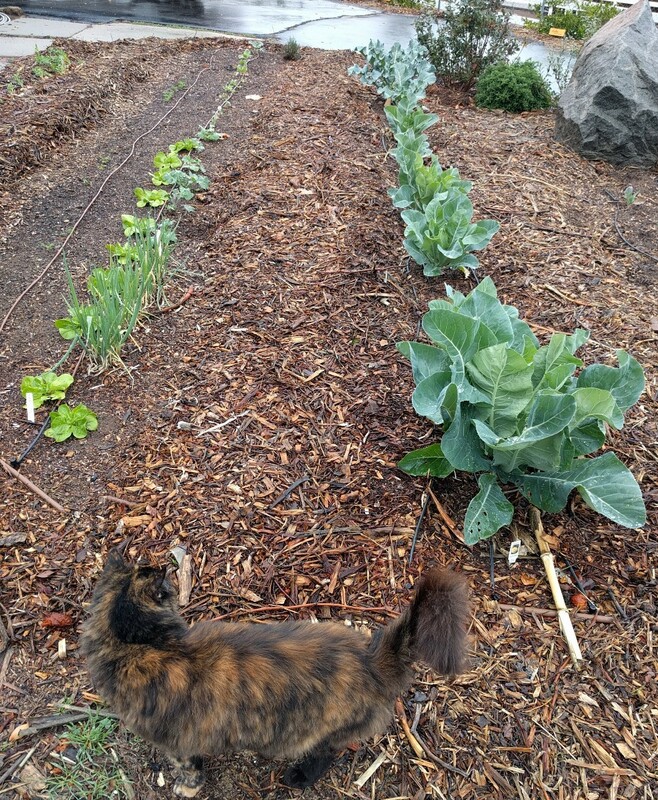 Mulched path above young brussels sprouts plants and below old potato plants. You may have heard the advice that it’s bad to walk on your garden soil while it is wet. It’s good advice; you can feel the soil compacting under your feet when you do. Even where I have compost as mulch, the soil still compacts a bit. Not so if there’s a thick layer of wood chips, however. This was shown clearly to me a couple of winters ago when I raked the wood chips off a path that I’d been using for years. I sowed peas into the soil below straight away — no digging, no amending. I expected I’d have mashed the soil under there after walking on it for so long, but I sowed the peas right into it just to see what would happen. I know this sounds suspicious, and I’m not sure of the explanation, but what emerged was the best crop of peas I’ve had to this day. That’s my best crop of peas on the right, and on the left are the little humans who feasted on them. What I do know after that pea crop is that wood chips certainly protect the soil structure well. 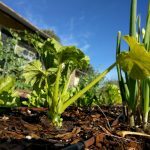 I should mention that you need not pay mind to the idea that spreading wood chips as mulch will “tie up” nitrogen and require that you add nitrogen fertilizer in order for your vegetables to grow well. This statement is found here and there, even parroted by people who you’d think you could trust, but never is any evidence given. Just remember that we’re talking about mulch here. 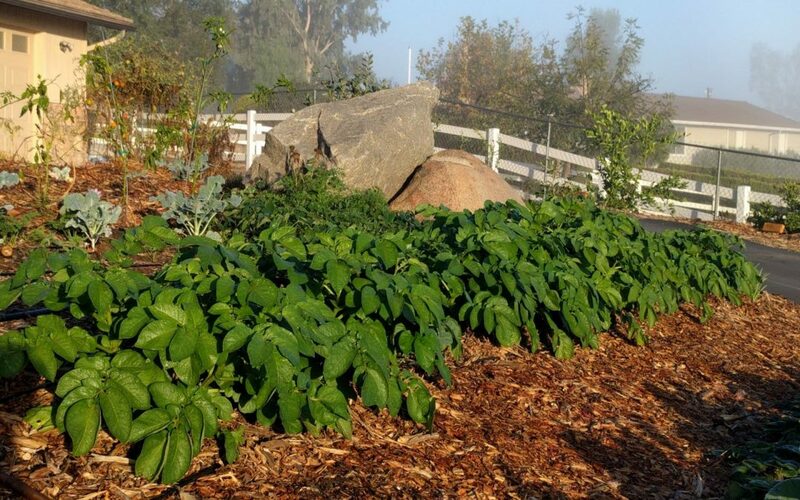 Mulch is something we lay on the surface and don’t dig into the soil. My garden has never shown a nitrogen problem after a mulch of wood chips was added. 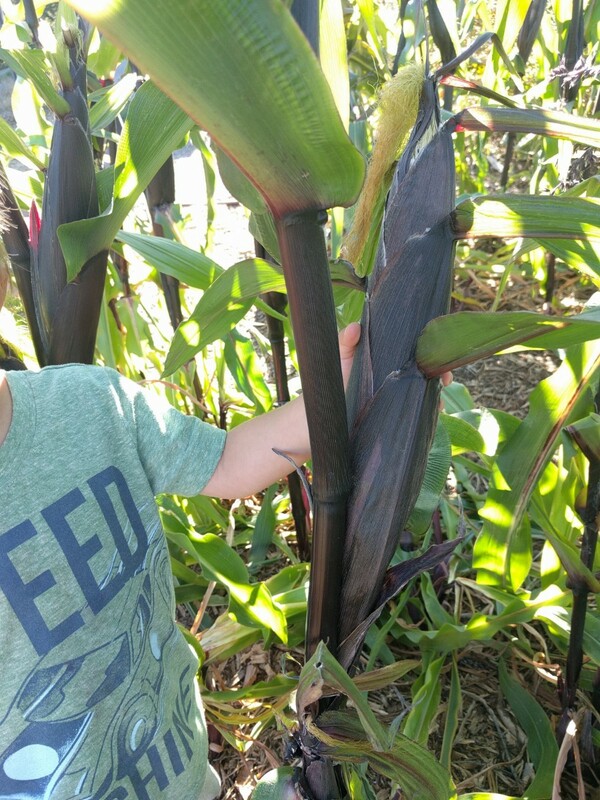 Here is some corn growing this summer among wood chips. I’ve added no fertilizer. The tall stalks, green leaves, and good-sized ears indicate that all is well down in the soil. 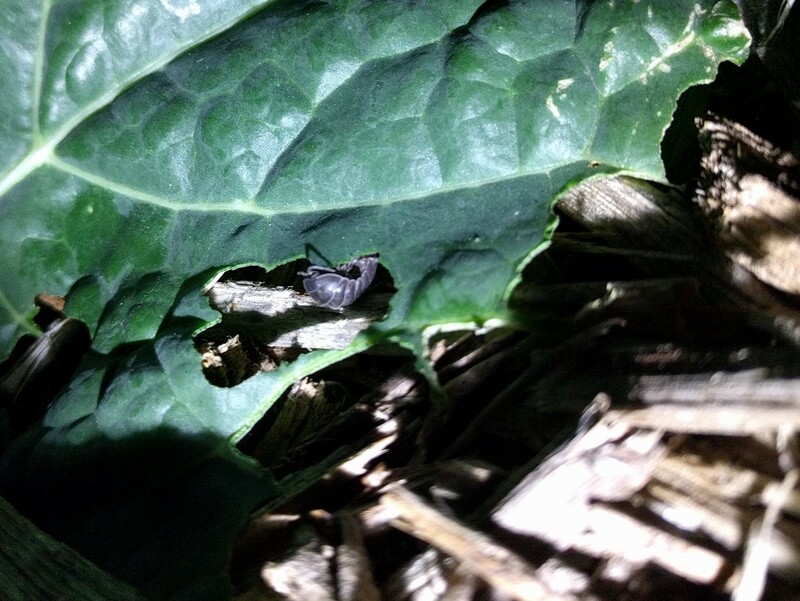 Back to the one downside that I’ve experienced with wood chips, that is, garden pest habitat. Here is how I mitigate that problem. When I am going to sow seeds or transplant vegetable seedlings, I rake back the wood chips so they’re only on the paths. When I do this, I usually see some surprised, scared pill bugs wondering where their home went. What I’m aiming to do is give them no shelter close to my baby vegetable plants, which reduces their feeding on them. All animals are as lazy as we are and will eat as close to home as possible. I sometimes add some compost to the surface of the soil at this time. Then I sow or plant. Left: a bed of baby plants where wood chips have been raked away. Right: bigger cauliflower plants with wood chips under them. Bottom: feral cat. Once vegetable plants are big enough to sustain a little nibbling, I start to bring the wood chips back around them. If you don’t have chickens, you might look into a product called Sluggo Plus (see it here at Peaceful Valley Farm Supply). 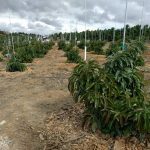 I’m not recommending it exactly because I’ve never used it myself, but I have been told by friends who aim to use few pesticides that it is effective on the garden pests that wood chips and other mulches give harbor to. 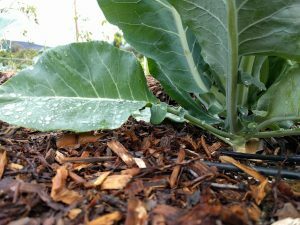 Wood chips as mulch on vegetables aren’t perfect, but I find that their benefits far outweigh their single drawback. If you have access to some, try them out. You might find them similarly useful among your vegetables. Did you find this post helpful? Share it with your friends! I have two raised/elevated 4×8′ garden boxes. Could I use mulch in there? I need something bcz so far not a lot of bounty but I’m a new gardener with lots to learn. I’ve heard straw is good too. 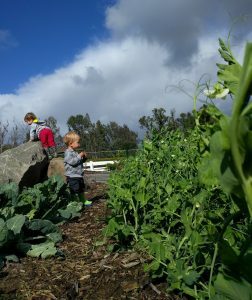 What do you think is best for small off the ground veggie boxes? Thank you! In a raised box for vegetables, I’d use a mulch of compost rather than wood chips. It’s OK to use wood chips, but since you’re not walking on the soil up there it’s not as useful. The compost, on the other hand, will improve the soil fertility and structure, retain moisture, suppress weeds, etc. 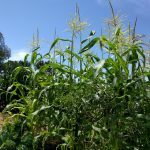 Just lay down an inch or two of compost on the surface once or twice a year and you’ll gradually see improvements in your plants. Eventually, you should never need additional fertilization either.